3. cannot publish new post, etc. One likely cause is this very common confusion due to the gmail ADD ACCOUNT feature. 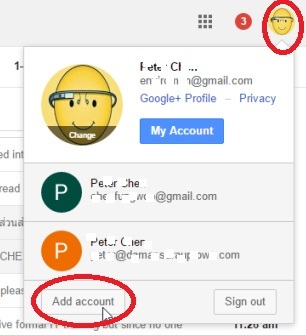 And if you click ADD ACCOUNT, you will open a new tab in the same browser which will allow to to sign into a new gmail account. Note: Your Blogger account in this browser is associated with the first gmail account which you first sign in. If in this tab where you are signed into, say, gmail 2, the Blogger dashboard will not be associated with gmail 2 but gmail 1. So you may go complaining how come you cannot find your blog, cannot edit, cannot publish new post etc. The solution is to open a new browser and use this browser to sign into that gmail account which is associate with the Blogger account you want to edit, publish post etc. Take note that although you can add accounts for gmails in multiple tabs with only 1 browser, you will only be logged into that Blogger account which belong to the first Google/Blogger/gmail account in the first tab. Perhaps what I can suggest is if you have more than 1 Blogger/Google/gmail account, you use more than 1 browser, each browser for different Blogger account. Here is what you should do in greater details. Make sure you are signed out of every gmail/Blogger/google accounts in every browsers with only 1 tab. Maybe even clear cache and cookies in each browser if you want. I don't use a gmail account. I have Google mail, and a google account. Three or four years ago, I wrote several blogs, One called "Aerial's Blogs." I can find no trace of them. Was I supposed to contact someone, or have added to them so they wouldn't be deleted? Can you open as many browser as you have accounts and log into each of those accounts separately and see what you turn up?